Galvanized strapping has excellent corrosion resistance for goods or products that need to be strapped for long periods in the weather. Galvanised strap is also highly flexible so its also great for users who need to bend or weave it through products. 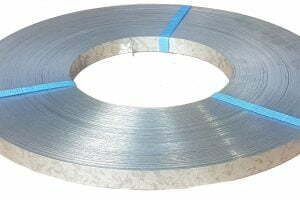 19mm Galvanized Steel Strapping has excellent corrosion Resistance for goods or products that need to be strapped for long periods in the weather.